The new center builds on associate professor Joe Wartman’s post-disaster data collection expertise, including leading a team of NSF-sponsored researchers to collect data following the 2014 Oso landslide, the deadliest in the history of the United States. 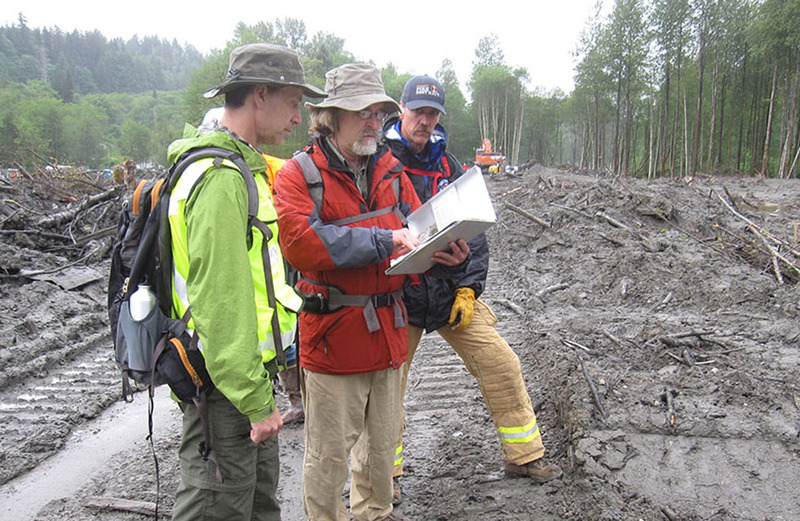 Here, Wartman (left) reviews field notes on observations made during the landslide investigation. It may come as a surprise, but natural disasters do have a silver lining. They provide a learning opportunity and a chance to reduce damages incurred in future catastrophes. With this objective, the UW has received a five-year, $4.1 million Natural Hazards Engineering Research Infrastructure (NHERI) grant from the National Science Foundation (NSF) to fund a new disaster investigation center, the Post-Disaster Rapid Response Research Facility. Led by Civil & Environmental Engineering (CEE) faculty, the center will enable the collection, assessment and archiving of high-quality data in the aftermath of disasters, which will be used to develop more resilient communities. Located in CEE, the new center will headquarter data collection in the aftermath of two types of natural disasters: wind hazards, such as tornadoes and coastal storms, and earthquakes, which includes earthquake-induced tsunamis. The shared-use facility will be open to UW researchers as well as the broader research community across the nation. The center will offer not only tools and data collection equipment, but ongoing support and guidance for research teams deploying to disaster sites. Data will be carefully collected, stored and shared as open-source data with the broader research community. 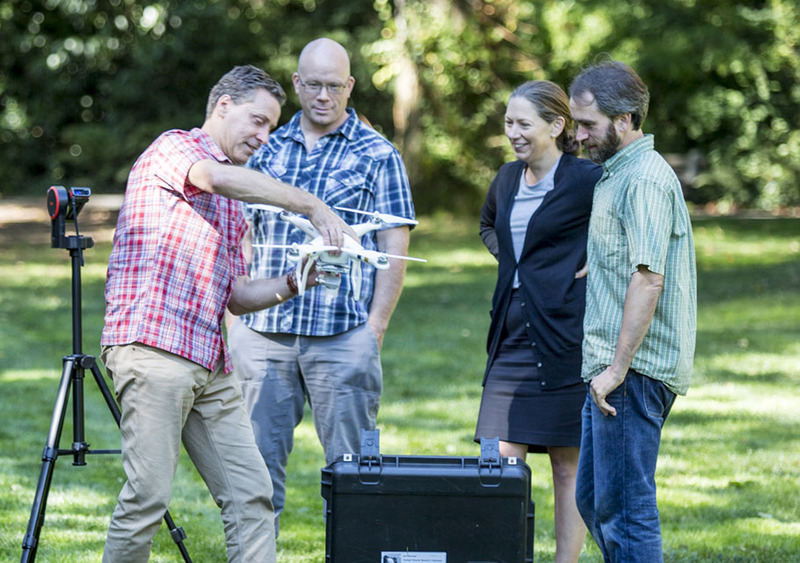 The UW faculty team tests an Unmanned Ariel System, or drone, that will be used for aerial reconnaissance. Led by Wartman, the new center is managed by an interdisciplinary team and includes CEE faculty Jeffrey Berman and Laura Lowes, along with researchers from the University of Florida, Oregon State University and Virginia Tech. The center comes at a time when total losses from natural disasters are increasing yearly. With the concentration of urban communities, natural disasters make cities increasingly vulnerable. The damage incurred world-wide from natural disasters that occurred between 1980-2014 is estimated at $4.2 trillion, according to World Bank. Within this timeframe, losses escalated rapidly, starting at about $50 billion per year in the 1980s and reaching almost $200 billion by 2014. The center builds on CEE faculty’s collective expertise with post-disaster data collection and analysis. Wartman led a team of NSF-sponsored researchers to collect data and document conditions following the 2014 Oso Landslide, the deadliest landslide in the history of the United States, and also gathered data in the aftermath of the 2011 Christchurch earthquake. Berman’s current work includes NSF-funded research to develop new seismic load resisting systems to minimize post-earthquake repair costs and investigating impacts of a Cascadia Subduction Zone Earthquake on the Pacific Northwest. The new center is part of a larger $19 million NHERI investment that follows an earlier $40 million NHERI grant, announced in September 2015, which funds a network of shared research centers and resources at various universities across the nation. The overall objective is to enhance the resilience of buildings, tunnels, waterways, communication and energy systems, and more, in order to lessen the vulnerability of communities during natural disasters. Learn more about NHERI funding and projects. 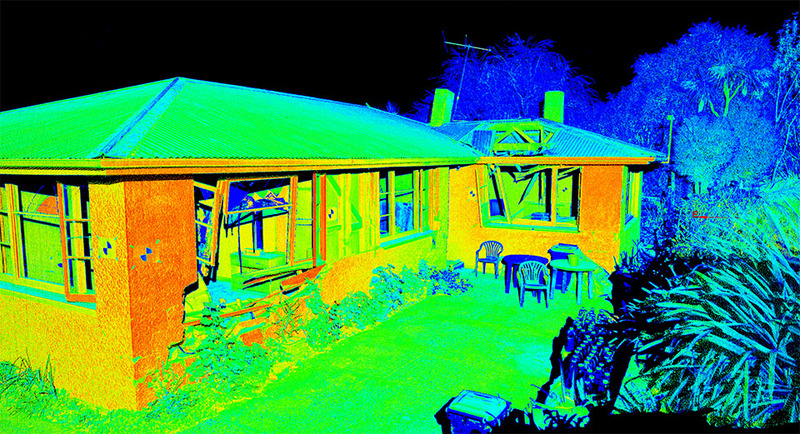 The new center will use state-of-the-art laser equipment to provide detailed scans such as this one, which shows a home damaged by rockfall during the 2011 Christchurch earthquake. The ultra-high resolution helps investigators better understand factors that enhance the resiliency of homes. A Web-based data repository called DesignSafe-CI will allow the various NHERI research teams to share and archive information. Headquartered at the University of Texas at Austin, Professors Laura Lowes and Pedro Arduino are members of the management team. The Computational Modeling and Simulation Center’s goal is to advance natural hazards simulation. Based at the University of California, Berkeley, the center is co-led by Professor Laura Lowes and includes faculty members Pedro Arduino, Michael Motley and Peter Mackenzie-Helnwein. This entry was posted in Uncategorized on November 29, 2016 by ceenews. UW CEE researchers Long Zhang, Ryan Routsong and Professor Stuart Strand, from left. Even after munitions and explosives have been discharged, they still have hazardous impacts, such as introducing toxic particles into the soil and waterways. To address this problem, and minimize the pollution that originates at military base training ranges throughout the country, a team of researchers has developed a new grass species. Led by CEE research professor Stuart Strand, CEE researcher Long Zhang and faculty at the University of York, England, have developed a new grass species by introducing two genes from bacteria that learned to use a toxic compound in explosives, called RDX, as their food source. When toxic RDX particles hit the ground, they are absorbed by the plant roots and broken down into nontoxic substances. Listed as a potential carcinogen by the Agency for Toxic Substances & Disease Registry, RDX is unique from other explosive compounds as it dissolves easily in water and is prone to spreading contamination. When it rains, RDX can easily move through the soil and end up in waterways. The paper was published in the Plant Biotechnology Journal on November 16. Co-authors include UW civil and environmental engineering research techs Ryan Routsong and Quyen Nguyen. This entry was posted in Uncategorized on November 22, 2016 by ceenews. Alumnus Wayne Levinson (MSCTL ’17). With his business and logistics background, Levinson founded Bulk FR8 in 2011. Specializing in the transport of bulk liquid using tank trucks, the company serves a very niche market of primarily transporting bulk chemicals. The company’s employees are regularly trained on chemical transportation and they also work with a select group of fewer than 200 carriers, rather than the industry norm of thousands of trucking companies, to ensure quality control. “Our company is unmatched in its ability to offer specialty chemical companies the opportunity to fully leverage the benefits of a variety of third party logistics services tailored to their unique needs,” Levinson said. Initially operating as an independent contractor for another brokerage, the company went independent in 2013 and within the first year annual sales reached $5 million. The company now employs 11 full-time staff in addition to their outside sales team. Levinson was motivated to start the company while working for one of the largest chemical transportation carriers, Schneider Bulk, in Green Bay, Wisconsin. At the time, he was fresh out of college from Indiana University and was working as a rotational leader completing rotations in driver recruiting, operations and customer service. After realizing there were few freight brokers that specialized in bulk transport, he saw both the need and opportunity for a new company. “I love that every day I get to solve a new problem for clients,” Levinson said. In addition to being the sole owner of Bulk FR8, Levinson is the third vice president of the Northwest Chemical Association and serves as the Transportation Intermediaries Association Hazmat Committee Chair. And, he is also busy setting future goals for his company- such as reaching $50 million in revenue by 2019. This entry was posted in Uncategorized on November 21, 2016 by ceenews.